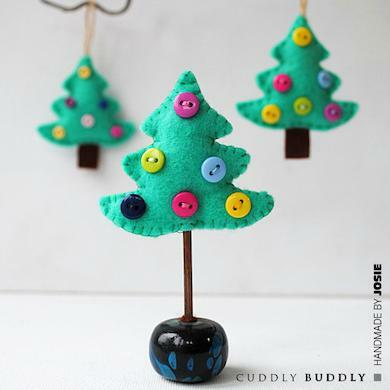 Whilst I love zooming up and down on my sewing machine, there’s something about the shorter winter nights which makes me want to curl up in front of the fire with a hand sewing project and here’s the ideal make - Funky little felt ornaments. They’re perfect for hanging on your tree or adorning that special present. I’ve also included a freestanding version, offering up even more decorating possibilities for your dinner table or festive mantel! Trace around the wooden Christmas tree shape onto your green and brown felt and cut out the required number of pieces. You will need two green tree fronts and one brown trunk for each ornament. I used a light green felt which, combined with bright buttons, gives a really modern feel to the project. Should you prefer a more traditional theme, simply use a darker felt and scarlet buttons. Place the mini buttons into a pleasing arrangement and then stitch securely using matching thread. Using green thread stitch around the tree shape, inserting a burlap loop at the top and the brown trunk piece at the bottom. If you are making the free standing version, colour a craft stick with brown felt-tip pen and insert along with your stuffing. Insert the craft stick into a large wooden bead or wooden sewing bobbin. Now simply give your new handmade ornament pride of place amongst your other decorations! Hi, I’m Josie, I live in the North East of England with my husband, two children and a very naughty cat. I enjoy all things creative, but my first love is sewing, especially appliqué. I'm frequently published in UK craft magazines and you can also get loads more free tutorials over at my blog sewforsoul.